According to yahoo group another bath of 9.7m Enviro 200 MMCs has been ordered for the 393 for a delivery in 6-8 months is that true? 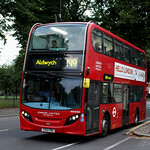 So what's the long term plan for the 393 will the loaned Arriva London ENS' stay with the 393 for the whole contract? Don't Arriva London want them back? What's the plan for DELs that were originally ordered for the 393? Evidently, if Arriva did have any plans for the ENSs, they have decided that hiring them to Metroline is more lucrative just for now. They have little book value anyway given their age, and Arriva are hardly expanding their operations outside London at the moment. Arriva also has "form" when it comes to hiring to Metroline, remember the Optare Solos on the H2/H3/631? We shall have to wait and see what Metroline does, both with the DELs (currently in store at Perivale) and with any order for new buses for the 393. I can't see the hired buses being acquired and doing the whole contract, again because of their age. Only guessing but possibly the 393 will convert to fully DEM using more PB examples with the 234 gaining a full DE allocation using DE's displaced from wherever the DEL's end up. I thought the 95 was a good place for the DEL's to go but I was rightfully reminded about a possible restriction that the 487 has that could affect the 95 - the 226 or 316 are probably ideal candidates. I'm not sure where the low bridge is but it started tracking at Upper Clapton Road. It could really be happening. ENS3 is the only one from LVF which did not correlate to sightings in real life, as the rest were either temps which ended up being ENSs, ENSs that were identified, or DEMs. LVF history shows the last day of service being the 22nd, but clearly sighted on the 23rd by photograph. Also ENS3 tracked to same times as the VW times, with iBus completely on. That would leave 5 DEL’s still to allocate - what may happen is DE’s end up there instead if the DM’s & 1 DE allocated to the 190 aren’t upgraded. 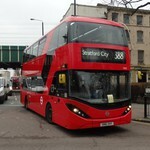 I could instead see the 190 being allocated 09reg DEs from the 209/395, to replace the DMs and standardise the fleet. This would then mean all 09reg Metroline DEs (not ex-First examples) at AH on the 117/190. The older 58reg DEs at AH could be withdrawn as well. Liking the London Sovereign takeover but I will always love the Metroline VP. Looking at PVRs of existing Metroline SD routes, the 143 would perhaps be the most suitable route to gain the 19reg DELs. The main and school PVRs combined is 14 - the same as 393. And the 143 could probably do with some extra capacity. The DEMs from the 234 and plus the DEMs that are refurb float leaves the 393 with 13x DEMs which has a TVR of 16. The 393 will need 2 more DEM to be fully DEM. I wonder Metroline get the extra 2. Can DEs go on the 382 or 384? @tp446 which of the ex First vehicles are owned and which ones are leased? Talking about extra capacity the 143 needs some TEs on it to be honest with you.. But if the 393 is going KC after 214 is gone and HT will take the 143 and run it with DLEs would be amazing.